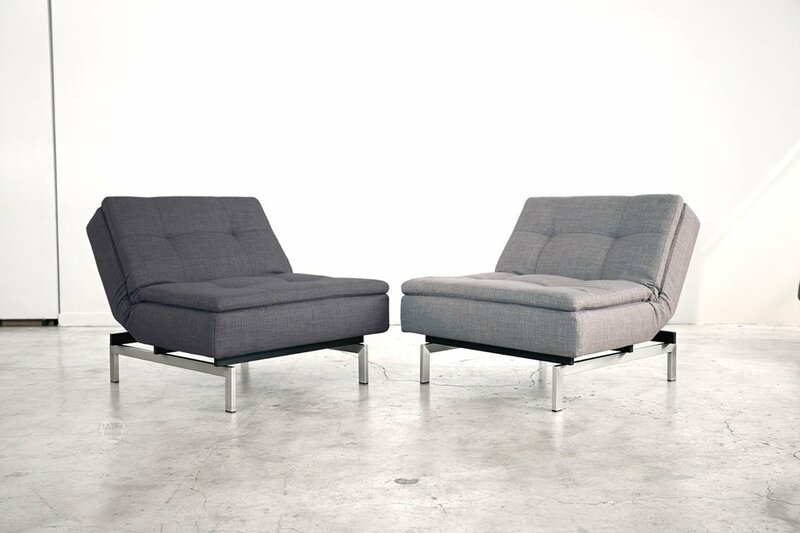 Great Comfort Every Day with the Vogue Convertible Sleeper Lounge Chair. 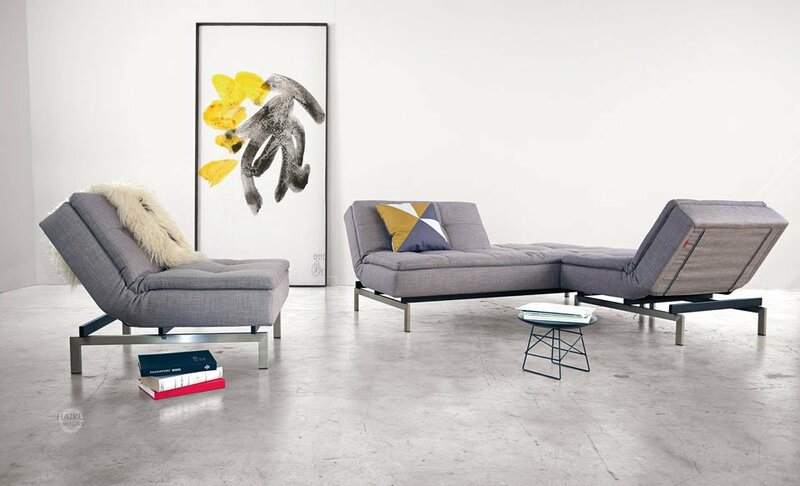 When you want dramatic style, contemporary design, lasting comfort and functionality in a sofabed, the Vogue Convertible Sleeper Lounge Chair and Sleeper Sofa are perfect for your new living room. This multifunctional modular sofabed is so comfortable as a couch and easily converts into a sleeper sofa when company comes to call. Consider adding a Vogue Convertible Lounge Chair and you have found an affordable living room set that you and your family will enjoy for years to come. The Vogue Convertible Sofa and the Vogue Convertible Lounge Chair feature a thick, comfortable 7-inch cushion with an extra pillowtop layer for softer sitting comfort and a thicker mattress for sleeping. Excellent quality construction with style, function, and comfort. The Vogue Convertible Sofabed offers the standard, upright sofa position and has several drop down or Lounge Positions for better enjoyment when you are watching TV or enjoying the company of friends and family. The Vogue Sofabed also offers the unique feature of a split backrest, which allows you to drop down half of the backrest on either side you choose. No matter which features works best for you, the backrest in the upright position for reading or reading your favorite bestseller, lounge position for a more comfortable seating posture or flat position for resting or sleeping through the night, you'll find this versatile Sofabed is an affordable best buy with elegance and style. 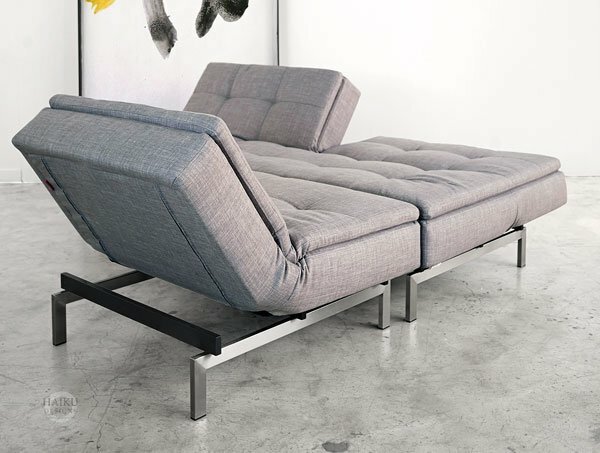 This Vogue sofabed features the latest Eco-comfort technology composed of a sturdy steel frame, chrome steel legs, individually nested pocket springs, and a layer of Euro-Foam cushioning and natural fiberfill. In a traditional open coil spring system, springs are interwoven so that when one person sits at one end of the couch motion or movement to the other springs occurs, leading to the uncomfortable movement of rolling-together or the feeling of being bounced around. The Vogue Convertible Sofabed, like the Chill Sofabed, incorporates a superior system without motion transfer due to the nested coil system. What this means is that each pocket spring is nested and placed in a material pocket individually and then sewn together. 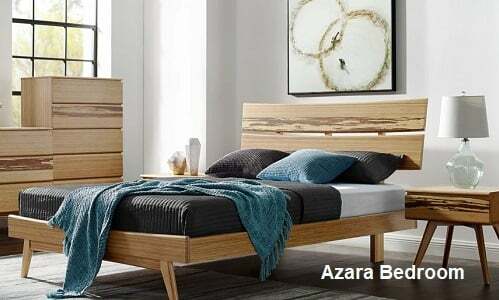 This special coil system offers a firm and comfortable rest and while at the same time producing zero motion transfer from one person to another, because each spring reacts individually. 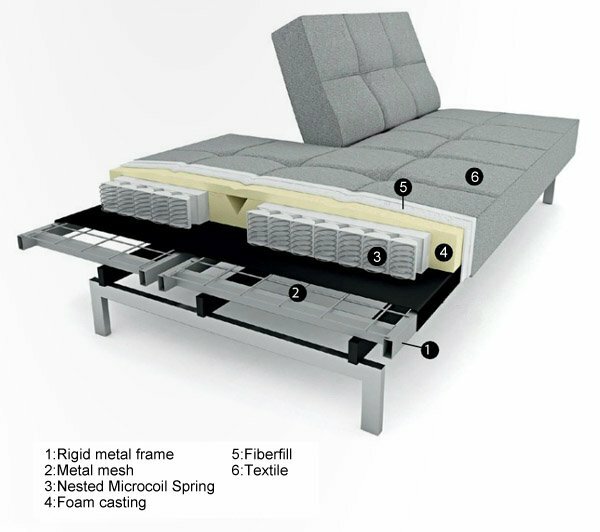 Even in the sofabed position, each sleeper will be individually supported for a restful nights sleep. Special Eco-Foam surrounds this unique nested coil system and is then wrapped in a Light Grey or Dark Grey Linen cover. 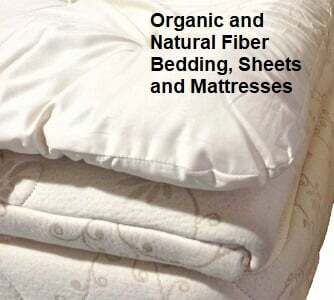 These specially designed materials do not off-gas as much as do more conventional covers and foams, and due to the fact that they incorporate an extra tight weave of extra fine fibers, they are stain resistant. The real benefit is a beautiful, comfortable, high-quality Euro style sofabed and lounge chair, with less synthetic chemicals on the surface where you sit and where you place your head. Better for your health, Better for the planet. Truck line shipping and simple assembly required. Chair Size: 35" wide x 36" deep. 31" from floor to the top of the backrest. We're excited to put our new mattress on our new bed! I look forward to receiving the items I ordered from Haiku Designs as well as ordering more items in the future. I appreciate being able to buy from a company that is devoted to selling good quality as well as healthy products. I hope to be a part of helping to create a healthier more sustainable world for future generations. © Haiku Designs. All Rights Reserved.